Better knowledge means better results. And participatory evaluation helps to mobilize local knowledge, together with outside expertise, to make development interventions more effective. This book presents leading-edge analysis on the theory and practice of participatory evaluation around the world. With its instructive case studies from Bangladesh, El Salvador, Ghana, India, Indonesia, Kenya, Mexico, Nepal, and St Vincent, the book is a guide to a community-based approach to evaluation that is at once a learning process, a means of taking action, and a catalyst for empowerment. 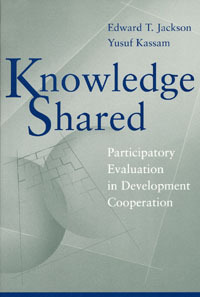 Knowledge Shared is the most comprehensive book now available on participatory evaluation. It is intended primarily as a tool for practitioners and policymakers in all segments of development cooperation, but will equally appeal to students, professors, scholars, and researchers in development studies, development administration, evaluation, environmental studies, social work, community development, rural development, international public health, and other disciplines related to sustainable and equitable development. Edward T. Jackson is Associate Professor of Public Administration and Director of the Centre for the Study of Training, Investment, and Economic Restructuring at Carleton University in Ottawa, Canada. Yusuf Kassam, formerly Professor of Adult Education at the University of Dar es Salaam in Tanzania, is a consultant in adult education and international development based in Toronto, Canada.